Home / Gold / Investing / Mutual Funds / Which is better - Gold ETFs or Gold Funds ? Which is better - Gold ETFs or Gold Funds ? The buzz word in the investing world is now - GOLD. 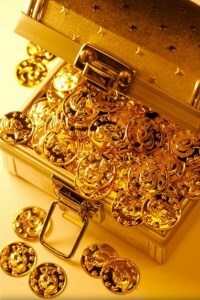 Nowadays, there are many ways to invest in gold, other than buying physical gold and they are Gold ETFs and Gold Funds. There is a lot of confusion among retail investors about understanding and investing these products and we are quite sure this article would clarify things better. To make things clear, both Gold ETFs and Gold Funds are mutual fund products — only the mode of purchase differs. The Gold Funds are fund of funds, which invest in their own fund house ETFs, for e.g., HDFC Gold Fund invests in HDFC Gold ETF. Similar funds have been launched by Reliance mutual fund, Quantum mutual fund and Kotak mutual fund. Investors can get details of these funds from their respective websites. ETFs are exchange traded funds launched by leading mutual funds which are traded in stock exchanges like Nse and Bse. You need a Dmat account and a trading account with your stock broker, to buy and sell these ETFs. Charges involved are brokerage charges and Dmat charges. They can be bought and sold over the exchange through a broker on a daily basis during trading hours. Gold ETFs provide an opportunity to benefit from changes in price movements of gold as the prices of gold ETF reflect the value of the underlying gold on real time basis. SIP is not possible, since it involves manual purchase by the investor every month. Gold Funds are fund of funds launched by mutual funds, which can be bought and sold through mutual fund agents or through online websites offered by the fund houses. You don't need a Dmat account or trading account. Charges involved - no entry load, but exit load of about 1 - 2%, if sold before one year from the date of purchase. Can be bought and sold on any working day, but the NAV of the fund at which the fund sells the units is based on the closing NAV calculated based on price of the gold on the previous day. SIP can be done, which is a good positive thing, since investing a fixed sum of money every month ensures you better average cost of purchase. To sum it up, investing in Gold Funds are for those investors who want to invest in a simple and systematic method, involving lower costs. Whereas ETFs are for those active investors and traders, involving high costs and continuous monitoring of buying and selling. Gold funds by mutual funds are better than ETFs, considering the processes involved. An ETF is like a share so you can buy it from the broker like you buy any share. lets suppose, you need about 250 gms of gold for your sister's marriage..
start buying regularly in gold etf, so that you can accumulate 250 gms gold by that time. its pure, liquid and tax efficient investment. When each GOLD ETF is investing in the same asset (Gold) and all the gold ETFs will move up or down based on the price of gold, So, from where do you think that a significant difference in performance will come that you will be able to differentiate the good, the better the best in business? Yes, there is indeed a differentiator!!! yes it is true that all Gold ETFs are the same. But, there is a difference in performance in each Gold ETFs. this is due to Expense Ratio and Tracking Error. After painstaking research, I have zeroed in on RELIGARE GOLD FUND as the BEST Gold ETF as not only it has the least Expense Ratio among all the Gold ETfs but also the least Tracking Error. After reading this, i have planned to invest in gold funds. Im new to investing. How much minimum account can i invest each month in gold funds? Whom should i approach? Will i get a certain amount of profit each month or only after i sell it? What type of fund should i go for to reap monthly benefits? Gold funds investing is not for monthly profits or benefits. you can invest in hdfc gold fund, and invest as low as Rs.1000 per month. This is for long-term only. You can contact nearest HDFC bank or HDFC mutual fund office.